Bridal Spectacular features a Las Vegas wedding captured by M Place Productions. It was a picture-perfect spring afternoon when Thalia and Gary’s became husband and wife at the gorgeous Grove. It was a day full of family, friends, celebration, and most importantly, love. Thank you both for letting Bridal Spectacular share your beautiful Las Vegas wedding with our readers! As featured in the spring edition of Spectacular Bride Magazine, Thalia and Gary’s wedding took place on a lovely April afternoon at The Grove Las Vegas. They began their celebration with a picturesque outdoor ceremony followed by a romantic indoor reception. 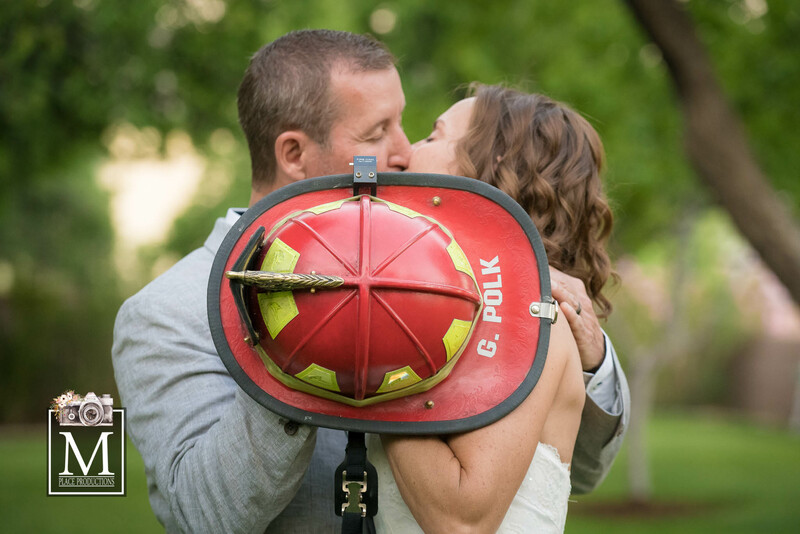 They featured a timeless wedding theme with shades of ivory and pink, gorgeous rose and baby’s breath bouquets, whimsical wedding signs, a lovely white three-tiered wedding cake with cascading flowers — with a dash of firefighter on the side. Thalia and Gary’s wedding was the perfect blend of elegant and playful! We hope you enjoy this glimpse of Thalia and Gary’s sweet wedding as captured by M Place Productions. Launched from a personal passion for artistic and moving imagery, M Place Productions found their place in creating romantic images that people cherish and love for a lifetime. They always strive to provide the best quality product and experience to their couples. M Place Productions understands that you have a lot of options available for your wedding — as such they truly care about their couples and strive to not only live up to expectations, but to also set new ones. To view more real Las Vegas weddings, please click here. Also, be sure to save-the-date for our Summer Bridal Spectacular show. Receive $4.50 off admission when you buy tickets online with promo code: BLOG2018. Click here for tickets and show details.